Did everyone have a nice Valentine’s Day? Did you give or receive anything special? Of course I have to ask, did you eat anything fantastically delicious?? If you read my last post, you already know I am not a huge V-day kind of girl. Yes, Boy did bring me my favorite long stemmed sun flowers. We spent the morning together in the kitchen, cooking and photo shooting an upcoming blog post (something very scrumptious, so stay tuned!). We also had a discussion about the day dedicated to love… the same exact discussion we have every year on Valentine’s day. I suppose we get a ‘F’ in original discussion content. We have decided (multiple times over), that V-Day is a sham… for several reasons. Why limit celebrating your love to only one day? If you are lucky enough to have love in your life, it should be cherished on the regular, right? And, on top of that, why make all the fabulous single ladies feel left out?? Therefore, I am going to boycott Valentine’s day next year. I am going to make huge posters and march, with burning passion and desire, at the foot of the capital building to rid our great nation of this elitist holiday. Too far? Yeah, I totally agree… besides I’m not that overwhelmingly ambitious, unless it comes to food. But hey, it’s the thought that counts. 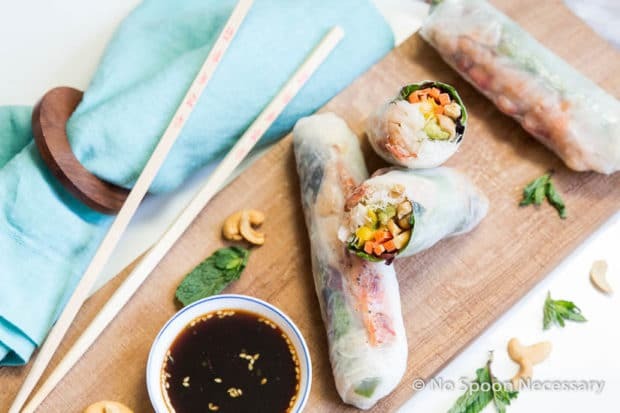 I’ll stop being a crazy lady and get to the point, to these spring rolls… which I might add, will never exclude anyone from relishing in their tasty pleasure. Lobster, Mango, Avocado & Cashew Spring Rolls with Spicy Asian Dipping Sauce. Light, healthy (Shhhh don’t tell! ), crunchy, slightly sweet, and definitely phenomenally fantastic. These rolled beauties are succulent (and a little fancy) from the lobster, sweet from the mango and mint, creamy and rich from the avocado, with hints of crunch and sweet saltiness from the roughly chopped cashews. All those wonderful, complimentary textures and flavors get joined by fresh spring mix lettuce leaves, and slightly chewy rice noodles, to form a winning combination. 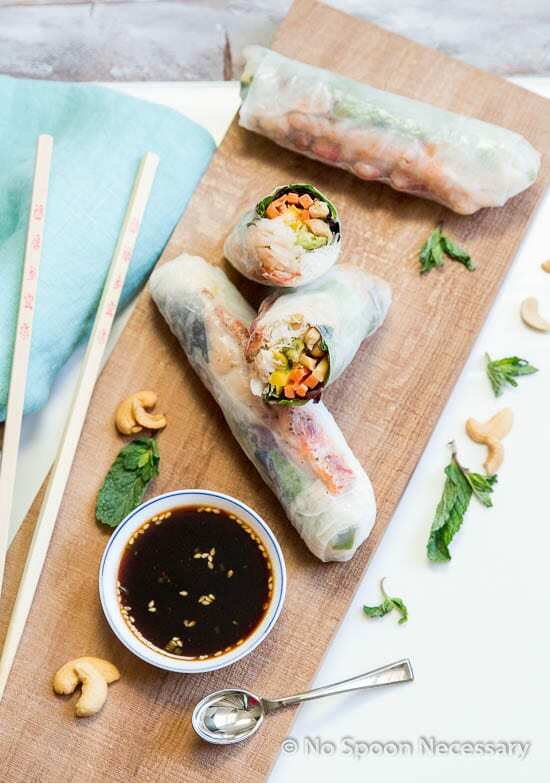 Thanks to the spring roll paper, you get to experience all those flavors simultaneously, for bite by bite delicious pleasure. These Lobster, Mango, Avocado & Cashew Spring Rolls will definitely tantalize your taste buds on their own, but as you know by now, I am a sucker for dipping sauces. So, of course, I whipped together a delicious sauce to accompany these rolls, for your dipping delight and pleasure. The sauce is slightly spicy, which plays well with all of the heavenly flavors in the spring rolls. However, the amount of spice in the dipping sauce can be eliminated, or increased, by simply adjusting the amount of Sriracha according to your taste. 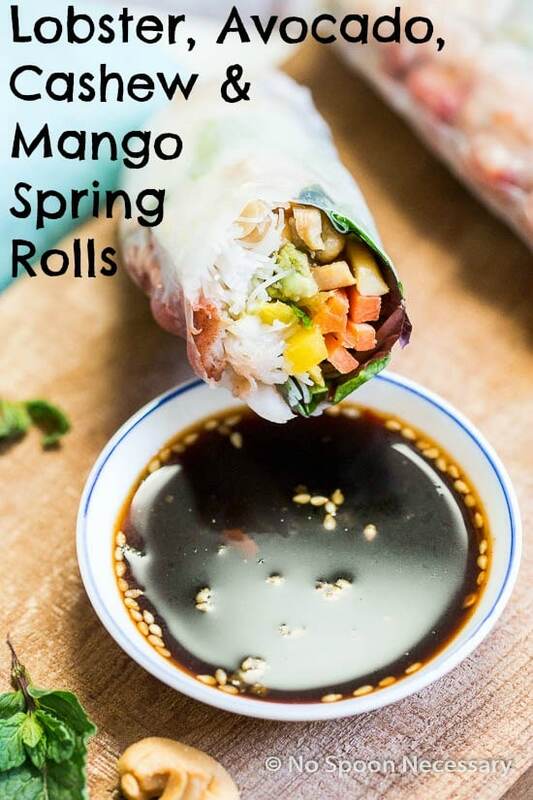 So, lets rock and roll some spring rolls… the help of a loved one is not required to enjoy these tasty, fresh treats. Cheers, dear readers, and enjoy! Lobster, Mango, Avocado & Cashew Spring Rolls. 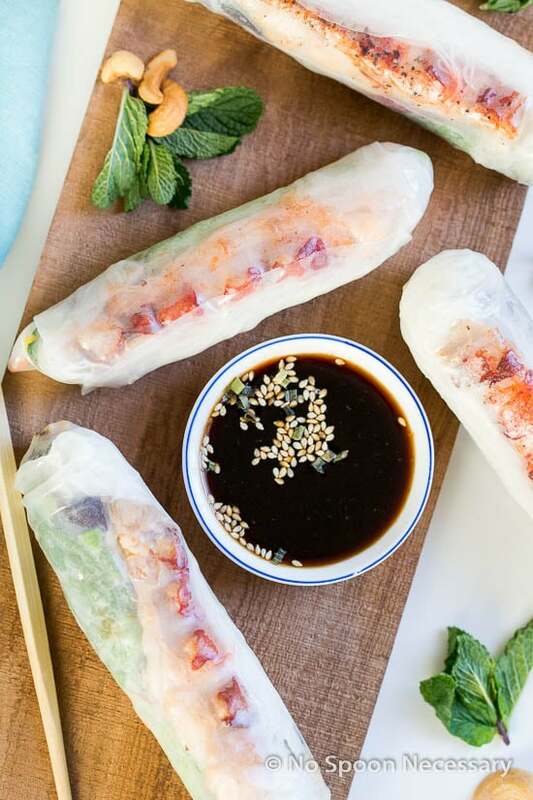 Served with a soy-sriracha dipping sauce these spring rolls are perfect for summer! Prepare the Asian Dipping Sauce: Combine all ingredients (aside from sesame seeds and chives) in a small mixing bowl. Whisk well to mix together. Taste and adjust for spice (Sriracha) and seasoning. Place in the refrigerator and allow the flavors to develop until ready to serve. Mise-en-place: Prepare all the ingredients for the spring rolls and line them up on a clean work surface. Line a sheet pan or platter with parchment paper. Fill a large, shallow bowl with warm (bath water temperature) water. To Fill Spring Rolls: Dip a spring roll wrapper, quickly, into the water. Since the paper is delicate, it only needs a quick, 5-10 second dip. The paper should still be slightly firm. The rice paper will continue to soak up the water on its surface as you assemble your ingredients, making it more pliable. 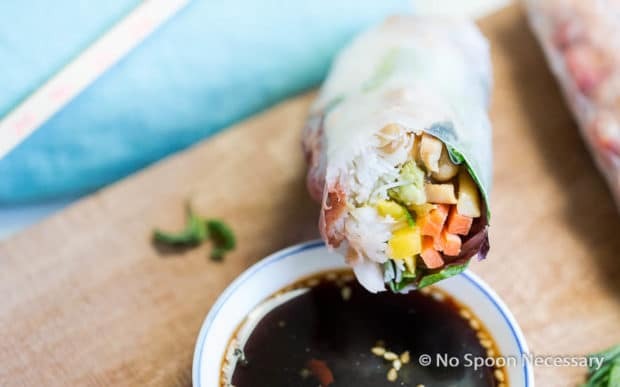 Place the dampened spring roll wrapper onto a clean, large cutting board. 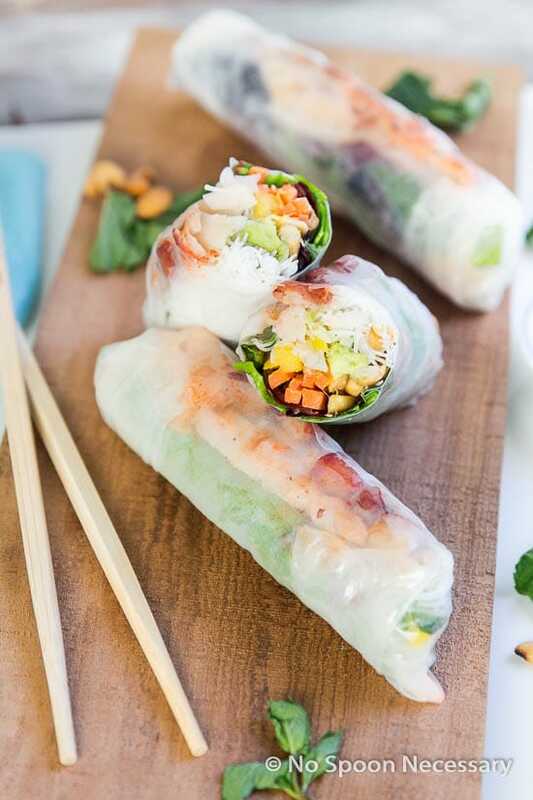 Starting at 1/3 of the rice paper CLOSEST to you, lay down your ingredients, beginning with the spring mix. Layer on the all remaining ingredients aside from the lobster meat. 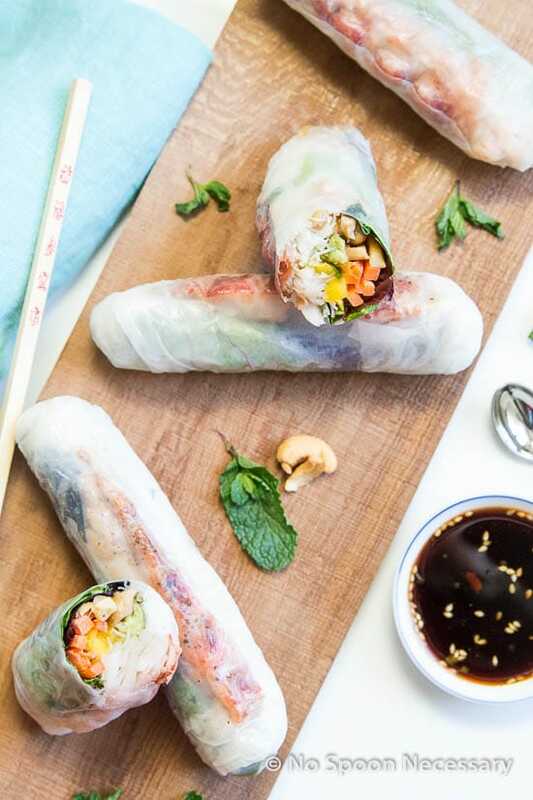 To Roll Spring Rolls: Start with the edge of the rice paper closest to you. Gently pull the edge of the wrapper up off your work surface and up/over the filling. 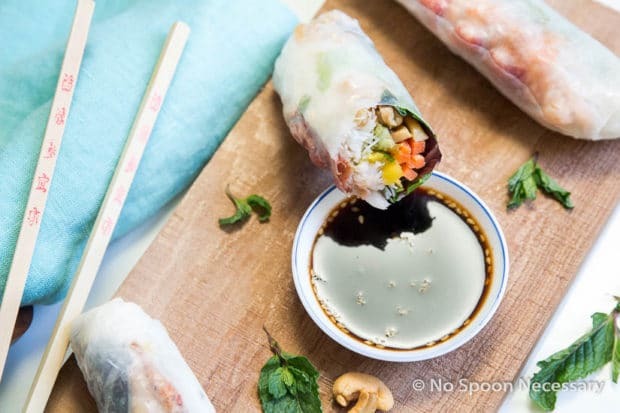 Use your fingers to hold the ingredients in place, tucking them into the rice paper. Once you have the spring roll wrapper all the way over the filling, gently roll just so the edge of the wrapper is touching the inside of the wrapper (one rotation/roll). Add the lobster meat to the inside of the wrapper, tucking it up against the fold. Next, fold in both sides of the wrapper to enclose the filling. 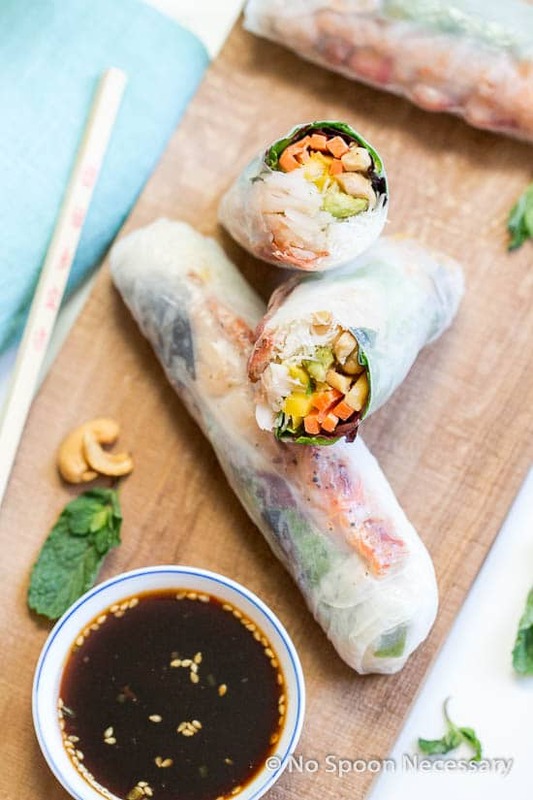 Continue to roll the rice paper forward, keeping the ingredients tight inside of the wrapper, until your spring roll is completely wrapped. Place the filled spring rolls onto the parchment lined pan/platter, making sure they are spaced apart and not touching (this will prevent them from sticking together and tearing). 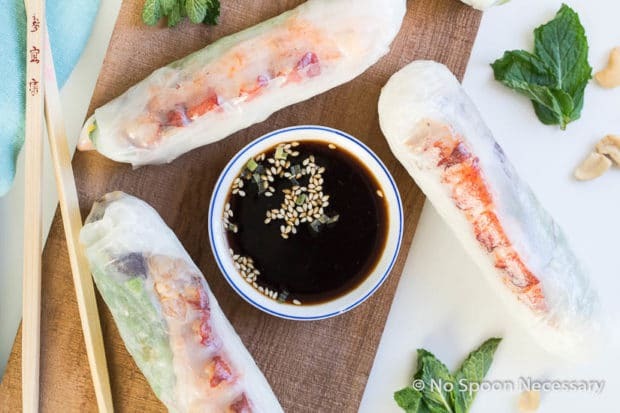 Cover with plastic wrap as you finish with the rest of the spring rolls. Serve with Asian dipping sauce. *To Cook Rice Noodles: Add noodles to boiling water. Boil for 1 ½ -2 minutes. Drain and rinse immediately with cold water. *The spring rolls are best eaten fresh, immediately after being rolled. However, I have stored them, individually wrapped in plastic, in the fridge for up to 2 days. *The Asian Dipping Sauce can be made in advance and will keep, covered in the refrigerator, for up to 5 days. How many are per serving? It honestly depends how much you stuff/fill each spring roll. If you generously fill (as I did), and yield 8 spring rolls, then the serving is 1 – please note the dipping sauce is also included in the nutritional information. 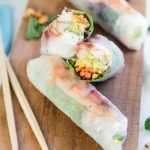 I love preparing spring rolls, but I have never tried them with anything other than traditional ingredients. I love the flavor combinations you used here – quite frankly they are exciting! My family would love these.